Whilst there are a few small flaws in both the singing and Tim Albery's staging, this revival of Verdi's Don Carlos by Opera North is an unquestionable triumph for the company. Their performance at The Lowry in Salford was absorbing as only Don Carlos can, and indeed should, be. The sense of collective purpose about the show was infectious, with soloists, orchestra, chorus, conductor and director all working together to consistently marvellous effect. The opera could be staged more spectacularly or in some cases sung more lavishly, but for thrills and emotion Opera North hits the nail on the head. Albery's production is beautifully directed from start to finish, with its shadowy corners always conveying the solitude of power. 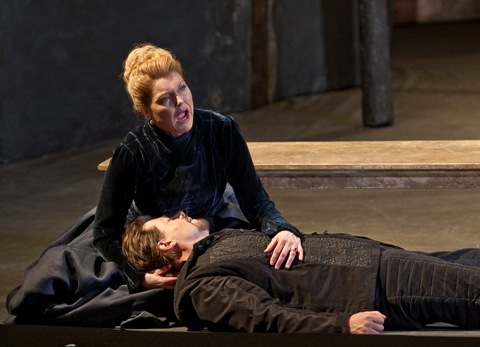 Philip's court is a lonely one, and the lack of physical contact between the King and Queen – except when he slaps her and causes her to faint, whereupon he rushes to support her during the ensuing quartet – is a powerful sign that the pair are oceans apart emotionally. Hildegard Bechtler's autumnal-coloured sets provide an unobtrusive background against which the drama can be played, and aside from the quite unnecessary literal visual representation of the souls going up to heaven after the auto-da-fe – we see women climbing a ladder rising out of the flames – it's an agreeably uncontroversial staging. I'm not sure whether credit is due to the conductor or the director, but the attention to detail in the text was impeccable, fully justifying the decision to sing the piece in Andrew Porter's superb English translation. The cast will go into the studio later this month to record the piece for Chandos' Opera in English series (sponsored by the Peter Moores Foundation) and I for one can't wait to hear the outcome. Nicky Gillibrand's lovely costumes evoke Spain in quite a subtle way, and yet their brilliance is that the characters are depicted as a normal family at war, rather than an elevated royal family. The human frailties of all the characters seem all the more believable in this rendering, so that even Elizabeth – who is often portrayed as snowy-white – seems savage in her banishment of Eboli, as well as being actively manipulative during her farewell to her lady-in-waiting when the King has sent her into exile. The emotionally and physically close relationship of Posa and Carlos is tenderly done, while Philip is quick-tempered and power-drunk rather than an old duffer losing his grip. 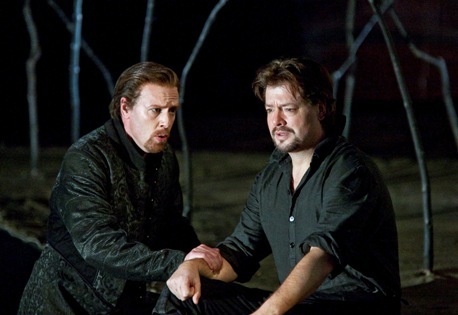 In short, it's all very well worked out, and it slightly surprised me how well Verdi's grandest of operas came across in a comparatively small theatre. 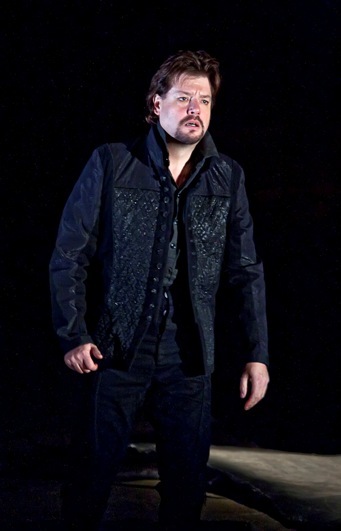 Vocally, the outstanding performance came from Julian Gavin as Don Carlos, whose heft and timbre at times evoke Giovanni Martinelli. The dramatically tangled opening aria was superbly shaped, and throughout the evening there was great artistry about his performance, but what made him stand out was the ideal fit of the voice to the repertoire. This was the only respect in which Janice Watson's performance as Elizabeth had any shortcomings: the lack of ease and metal at the top of the voice caused her to lose a couple of money notes in the Act 3 quartet and her final duet. Yet I can't imagine a more moving, noble and psychologically-probing portrayal of Elizabeth. The words guided Watson's performance from the very beginning, and the way in which she matched vocal colour to text was constantly involving. One of the most consistent performances of the evening came from Alastair Miles, who almost seemed to make Philip II the core around which the drama revolved. His raging jealousy and possessiveness was palpably conveyed to the audience, and the duets with Posa and the Inquisitor were absolutely riveting. Jane Dutton overcame a slightly too hard rendition of the Veil Song to make Eboli a wonderfully virile creation, while a slight lack of sturdiness in William Dazeley's voice was entirely compensated for by his elegance of line and clarion diction as Posa. A particular pleasure for me was Clive Bayley's Grand Inquisitor: this singer's killer combination of vocal beauty and strong projection is something special. Rebecca Ryan's Voice from Heaven and Julia Sporsen's Thibault were both excellent, too, though one or two of the smaller roles were less successfully taken. In the programme book accompanying the production, Richard Farnes writes about his hope of pacing 'the music so as to achieve a well-sprung yet perfectly natural delivery of text, which suggest to the audience that singing is as natural a form of discourse between the protagonists as speaking.' He fulfilled this aim in every respect: I can honestly say that I enjoyed Farnes' conducting as much of that of Gergiev and Haitink, whose readings of this opera remain the two best I've seen. The balance between stage and pit, the coloration of the instruments, the tempo choices and the sense of drama were well night impeccable. Opera North is fortunate to have such an outstanding Verdi conductor at its helm, and it's about time the bigger companies signed up his talent. Overall, this is as good a Don Carlos as you could hope to hear from a regional opera company and a sign that Opera North remains an important force amongst the UK arts institutions. Don Carlos will be performed again at The Lowry in Salford on 6 June and also tours to Newcastle (10 and 13 June) and Nottingham (17 and 20 June), as well as returning to the Leeds Grand Theatre on 24 June. In addition, the tour includes Mozart's The Abduction from the Seraglio (at Salford on 5 June) and Shostakovich's musical Paradise Moscow.